Stand a chance to win a copy of Warrior CD album! Entries for the Competition will open at 17h00 on Monday, 5 December 2016 and will close at 23h59 on Monday, 5 December 2016 (Competition Period). 1.1. The Afternoon Express “Warrior” CD Album Competition (Competition) will be run by Cardova Trading (Pty) Ltd in association with LeAnne Dlamini (Organisers/we/us/our). 2.1. Entries for the Competition will open at 17h00 on Monday, 5 December 2016 and will close at 23h59 on Monday, 5 December 2016 (Competition Period). 5.2. We will contact the Winners within 3 (three) days from the prize draw on the cell phone numbers from which the entries were sent. If a Winner is not contactable within 3 (three) days from the prize draw, and after we have made at least 3 (three) attempts to contact the Winner, that Winner will forfeit the prize and we shall have the right to select a different Winner on the same conditions except that we shall only be required to make 1 (one) attempt to contact each further Winner drawn. 6.1. 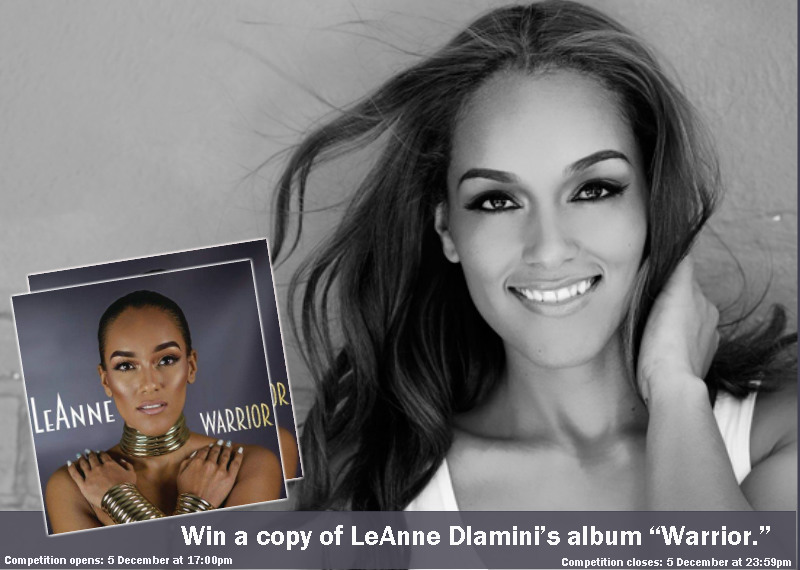 The Winner will each receive a CD copy of LeAnne Dlamini’s album, “Warrior” (Prize). 6.3. We will contact the Winner per telephone to obtain address details and to make arrangements for delivery of the Prize. The Prize will be delivered to the Winner per courier to an address within the Republic of South Africa, or as otherwise discussed, within 30 (thirty) days from the confirmation of the Winner. 6.4. The Prize, or any part thereof, may not be exchanged for cash any other item. Prizes are not transferable. 6.5. We reserve the right to substitute the Prize, or part thereof, with any other prize of a similar commercial value. 7.6. We will need to process your personal information to validate your entry, to send you marketing material and to contact you if you are a Winner to make the Prize available to you. By entering this Competition, you specifically and expressly consent to us processing your personal information for these purposes.